“The Invisible Enemy Should Not Exist” by Michael Rakowitz, 2018, London. Photo: David Matzdorf. Detail:“The Invisible Enemy Should Not Exist” by Michael Rakowitz, 2018, London. Photo: David Matzdorf. Public art can be defined today as art in any medium that has been planned and executed with the intention of placement in the public domain and is accessible to all. The best of public art is site specific and community involved. It invites a relationship between creative content and audience, challenges viewers, is sometimes multi-disciplinary, and is socially engaging. At the moment, the artworld’s mot du jour is multivalent. The term refers to a layered, often multimedia, artistic approach —conceptual, sculptural, painterly, spiritual, historical, political, etc. A stunning public art piece titled “The Invisible Enemy Should Not Exist” was unveiled last March in London. It is a sterling example of the multivalent. 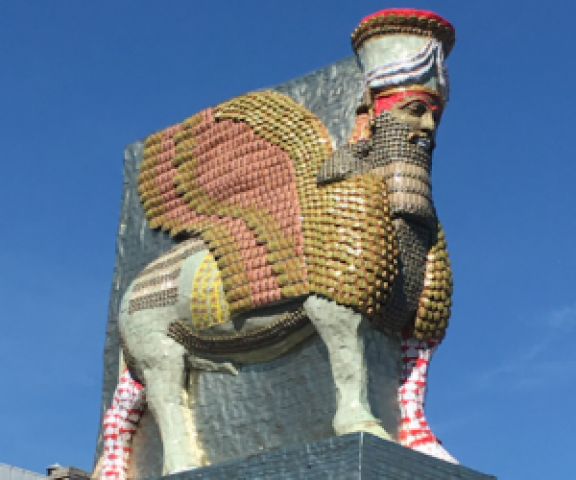 The piece is a wonderful as well as a poignant reconstruction of an ancient Assyrian sculpture (a lamassu, the image of a winged bull, a protective deity) which stood at the gates of Nineveh from about 700 BC until it was destroyed by ISIS in 2015. The work is set on a pedestal that sits on what is called the Fourth Plinth in London’s Trafalgar Square. 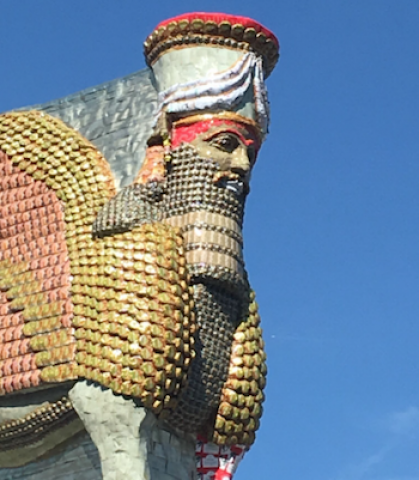 Made from 10,500 empty Iraqi date syrup cans (a brilliant idea), this artwork is scheduled to stand for two years and it makes a vibrant visual and conceptual statement; it is an inspired monument to the destruction of Iraqi humanity, culture, and history as well as powerful rebuttal to barbarian evil. In Mesopotamian mythology, the lamassu were protective minor deities or spirits. The Assyrian version of the “human-headed bull” figure played an integral part in the region’s mythology and art. Lamassu have wings, a male human head that sports the elaborate headgear of divinity, and the elaborately-braided hair and beards redolent of royalty. The body is that of either a bull or a lion; the form of the feet dictate whether it is one or the other. Generally, prominent pairs of lamassu were placed at entrances to palaces, usually facing outward; they were also sometimes located at or in internal courtyards. Heroic, spectacular examples can be found at London’s British Museum in London. Carved in high relief, these specimen, when looked at from the front, appear to be standing. Examined from the side they seem to be walking. In earlier versions the lamassu appear to have five legs. 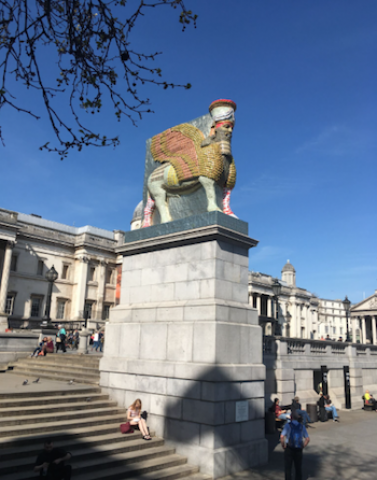 The 14ft-long sculpture on the Fourth Plinth is a life-sized “ghost” of one of these magnificent Assyrian half man/half bull creatures. The piece stands with its back to the National Gallery, staring southeast, past the Foreign Office and the Houses of Parliament towards its spiritual/cultural origins in the Middle East. Its creator, the Chicago-based artist Michael Rakowitz, a 44-year-old Iraqi-America, is currently one of the world’s most politically powerful artist-provocateurs. As well as underscoring the horrendous destruction of the original statue in February 2015, this artwork also references the appalling looting of 7000 priceless ancient objects by fanatical members of ISIS. Rakowitz explains that “this was the first moment of pathos, in that it didn’t matter if you were for or against the war, we could all agree that this was a catastrophe. It wasn’t simply a local Iraqi loss but one for the whole of humanity.” With this piece the artist not only universalizes the plight of Iraq but of the entire Middle East. Trafalgar Square contains large 19th Century stone plinths in each corner, three of which bear permanent statues. Due to budgetary and political reasons, the fourth pedestal was never completed. Since 1998 the empty plinth has been used to showcase temporary and quite different pieces of public art. Among the provocative artists that have been commissioned for pieces on the Fourth Plinth: Marc Quin, Bill Woodrow, Rachel Whiteread, Sir Anthony Gormley, Hans Haacke, Katharina Fritsch, Thomas Schutte, and Yinka Shonibare. Each artist attempted to create public art that was both compelling and aesthetically appealing. None has been more buzzworthy than Rakowitz’s “The Invisible Enemy Should Not Exist.” It is the 12th work to appear on the Fourth Plinth since the program began and it may be the most eloquently multilayered and universally referential. To my mind, this sculpture may indeed be the best work for the fourth plinth ever commissioned. Not only does the piece reference the recent bloody, destructive history of Iraq, but it also evokes the lost humanity and erased cultural heritage of the country and much of the region. The artist chose to recreate a full-sized winged bull. He also chose to fabricate it from flattened date tin cans in order to mourn the loss of the country’s major export trade in dates and date syrup, regarded by some as the best in the world. His artwork stands as “a palimpsest of loss” for the people of Iraq, their long culture and history as well as the decimation of what was once a great export industry — dates and date syrup, a major part of his own family’s traditional business. London’s Mayor Sadiq Khan believes that the sculpture’s place on the fourth plinth makes it “probably the world’s most high-profile piece of art, as an act of resilience against tyranny and religious fanaticism, and a celebration of pluralism.” It is estimated that over 20 million people will view Rakowitz’s winged bull over the next two years. “The Invisible Enemy Should Not Exist” is a rare transformative piece of public art, a sculptural form that succeeds as a splendidly visual epic poem: a gesture of defiance again vicious desecration, a projection of cultural heritage as a universal value. This article was first published in Arts fuse and appears here at their permission.